Sugar, W. (2005). Instructional Technologist as a Coach: Impact of a Situated Professional Development Program on Teachers’ Technology Use. Journal of Technology and Teacher Education, 13 (4), 547-571. Norfolk, VA: Society for Information Technology & Teacher Education. Retrieved April 24, 2019 from https://www.learntechlib.org/primary/p/4888/. Bradshaw, L. (2002). Technology for teaching and learning: Strategies for staff development and fo l low-up support. 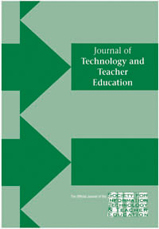 Journal of Technology and Teacher Education, 10(1) , 131-150. Carney, J. (1998). Integrating technology into constructivist classrooms: An examination of one model for teacher development. Journal of Computing in Teacher Education, 15 (1), 7-15. Guskey , T. (1995). Professional development in education: In search of the optimal mix. In T. Guskey & M. Huberman (Eds.) , Professional development in education:: New paradigms and practices (pp. 114-131). New York: Teachers College Press. Mouza, C. (2002). Learning to teach with new technology: Implications for professional development. Journal of Research on Technology in Education, 35 (2) , 272-289. Rogers, E. (1995) Diffusion of innovations (4th ed.). New York: Free Press. Schmidt, J. (1999). Counseling in schools: Essential services and comprehensive programs (3rd ed.). Boston, MA: Allyn and Bacon. U.S. Department of Education. (2000). Teachers’ tools for the 21st century: A report on teachers’ use of technology (OTA-EHR-616). Washington, DC: U.S. Government Printing Office.